This Spanish cod is smart enough to serve when entertaining but easy enough to make mid-week. 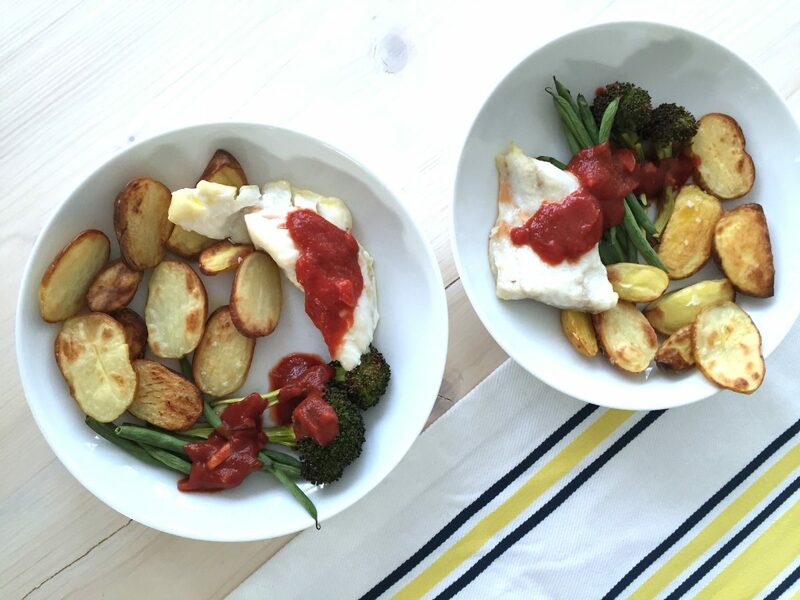 My children love this dinner – I think the tomato sauce and the potatoes are the child-bait. I love it too because there is minimal washing and once you’ve made it a couple of times you won’t really need to look at the recipe again. Patatas bravas is probably the most popular part of an old-school tapas experience but I don’t think many of us think to make it at home. Salty crunchy potatoes with a spicy sauce and aioli. Just heaven. If you want to, you can skip the fish and greens, make yourself a big bowl of the bravas, lay out some cured Spanish ham (jamon) and kick back with a chilled glass of Fino or Albarino. Pretty much my perfect night in. Aioli is traditionally served with patatas bravas and works really well with the tomato here. Because there is so little fat in cod it is important to have some good fat (in the form of olive or rapeseed oil) alongside to help your body absorb the vitamins and to keep you satisfied. If you’re making this for guests you can have the bravas sauce and aioli made up to 3 days ahead. You can slice your potatoes ready to go into the oven. Buy your fish the day you’re going to eat it for the best flavour and texture. I’ve added a time plan at the bottom of the recipe to help if you’re cooking for guests. 1kg (2.2lb) waxy potatoes also known as salad or new potatoes – bigger potatoes can be sliced thinly, smaller potatoes can be halved. Around 8 tablespoons good mayonnaise – I use Maille in the UK or Sir Kensingtons in the US. Or you can make your own mayo using the easy immersion blender recipe here. Around 500g (lb) skinless and boneless cod loin or fillet. A big thick piece is much better as it will cook more evenly. If you’re buying more than one piece to cook, ask your fishmonger to give you equal sized pieces. Make the bravas sauce by putting all the ingredients in a small pan with a lid. Bring to the boil then simmer on low for as long as you can. At least 25 minutes but up to 40 minutes is ideal. While your sauce cooks, wash and prepare your potatoes and heat your oven to 210°C (190°C fan oven) or 425°F. Get a large metal baking sheet and line it with baking parchment. Give it a quick rub with a teaspoon or two of olive or rapeseed oil. Leave the skin on and cut a thin slice from the bottom of your potato to give you a flat base. Then cut it in thin slices – a little thicker than a pound coin. Lay the slices on the baking sheet and continue until you’ve used all the potatoes. They can touch but try not to overlap them. If need be, use two baking sheets. Once they’re all sliced and on the tray, sprinkle them with a little more oil then use your hands to spread the oil evenly, sprinkle them with plenty of sea salt and smoked paprika and put them in the oven. Fish – Depending on the size of your piece of fish, it will take between 8-10 minutes to cook. Put your fish into a glass or ceramic baking dish. I use the type of dish I’d cook a lasagna in. Sprinkle the top of the fish with sea salt, freshly ground black pepper and smoked paprika and drizzle with a little olive oil – about 2 teaspoons. Set aside. Beans – Trim the stalk ends from your beans. I do this by lining them up and doing a single chop across the end, rather than doing each bean one by one. Then toss the beans in a bowl with 1 tablespoon of oil, 2 tablespoons of capers, juice and zest of a lemon, and salt and pepper. Set aside. Aioli –use a Microplane to grate half a small clove of garlic into a small bowl. Add the mustard and mayonnaise and mix well. Set aside. After 20 minutes of the potatoes cooking, put your cod and green beans into the same oven. I usually scrape my potatoes over to one side of the baking sheet and pile my beans on the other side to save washing an extra pan. Take the bravas sauce off the heat, stir, taste and adjust the seasoning. I usually need to add a little vinegar or salt at the stage. If you use balsamic you won’t need to add sugar but if you use read wine vinegar you may need a tiny pinch of sugar to balance the acidity of the tomatoes. Set aside with the lid on to keep warm. Check the cod after 8 minutes by gently pushing the middle of the piece of fish. It should gently flake but still look moist. If it is still firm, pop it back in the oven for two minutes then check again. Take the fish, beans and potatoes out of the oven as soon as you see that flaking, as the fish will continue to cook once out of the oven and this will mean it won’t dry out. To serve, sprinkle your potatoes with a little vinegar and pile them onto one side of your warmed plate. Scoop the beans alongside then use a fishslice or spatula to gently break your fish into 4 pieces. Place the fish on top of the beans. Drizzle the bravas sauce over the potatoes and dot the top of the fish with the aioli and a final sprinkle of smoked paprika. Serve immediately with a wedge of lemon on the side. Find more of my fish and entertaining recipes here.